Along with the gold rush, killers and thieves flooded into California. The worst desperadoes didn't carry six guns and ride fast horses. They were a band of genial New Englanders who stole more than Joaquin Murrieta or Black Bart could have imagined. The 1849 state constitution failed to set up a state bank. In the spirit of the times, the 1850 legislature was more concerned about claim jumping rather than well constructed banking laws. This failure opened the door to unscrupulous financiers. Established in 1849 the banking house of Palmer, Cook & Company was one of these. The principle partners in this shady enterprise were Joseph Palmer, Charles Cook, George Wright and Edward Jones. Palmer had been a tailor in Massachusetts before heading west. Charles Cook initially handled operations on the East Coast. George Wright was a former tavern owner in New England and like Palmer was personable but lacked scruples. Edward Jones, another New Englander, was a member of San Francisco city council. He was smart and as crooked as they come. Without bonding laws the bank set up its own insurance subsidiary enhancing its growing power. 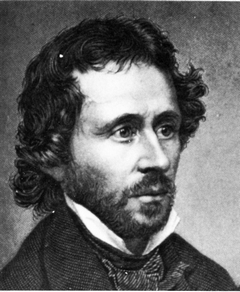 Through loans and John C. Fremont's poor business sense the bank obtained control of Fremont's Mariposas Grant. This set the stage for the bank and Fremont to con hundreds of thousands of dollars from unwary mining investors. These were investors who believed the bank's exaggerated claims of the riches to be made and the legality of Fremont's title. 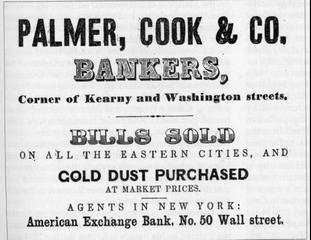 Failure of the respected Adams and Company Bank in 1855 resulted in a financial panic that reached into every county. It was an opportunity for Palmer, Cook & Company to enjoy another looting spree. A crooked receiver for the failed Adams and Company, Alfred Cohen, made a midnight transfer of $400,000 into the coffers of Palmer & Cook. Some of the shifted funds were later paid out to a few special claimants including the judge who had quietly approved the cash transfer. He was soon removed from the bench. Judge Lake fled to Peru to avoid arrest. Cohen was arrested for theft but spent less than two years in prison. Once all the bribes had been paid, Palmer, Cook & Company kept the rest for themselves ignoring the suffering of the former Adams and Company depositors. The collapse of Adams and Company caused other banks to fail in California. Few depositors were able to get any of their savings returned. Their losses caused a rash of suicides throughout the state. Bribes to prominent Democratic state politicians had bought the new bank the right to be the unofficial treasurer for San Francisco and the state of California. With Senator Broderick and Governor Bigler in their pockets, Palmer & Cook assumed the responsibility for depositing funds in New York for the support of California and San Francisco city bonds. Hoping to cause the bond prices to crash, in 1854 Palmer & Cook purposely delayed providing state funds to support the bonds. They and their cooperating politicians planned to buy the discounted bonds. The bank would then suddenly provide the support funds needed and then watch the value of their investments soar. But other banks unexpectedly stepped in to support the bonds. Following the scandal, Palmer, Cook & Company lost the right to handle the treasury's business. However in 1856 Henry Bates was elected the new state treasurer. Henry Bates was an old friend of Joseph Palmer and George Wright. This set the stage for the most brazen looting of the state treasury in California history. Bates again gave Palmer & Cook the responsibility for depositing funds in New York banks for financing California and San Francisco city bonds. Secret stealing had begun four months before Bates became state treasurer. All told Palmer, Jones, Wright and Henry Bates eventually removed $250,000 from the vault of the state treasurer. Some of the gold was immediately shipped east. Part of the treasure ensured that Nathaniel Banks became the Speaker of the House. A portion helped their friend, John Fremont, win the Republican nomination for President. All this vote buying was aimed at passing laws to protect the bank's various shady California land claims. A group of suspicious legislators paid a visit to the state vault. Alerted by friends in the legislature, Palmer and Cook quickly borrowed $124,000 in gold bullion from a friendly banker and placed it in the state vault before the legislators arrived. Once the legislators were satisfied, the bullion was returned to the local banker. The other half of the missing gold was accounted for by a phony Wells Fargo shipping receipt. On July 2, 1856 these thefts prevented Palmer, Cook & Company from sending sufficient funds to New York banks to cover the California and San Francisco city bonds. State senator Amos Catlin, a distinguished lawyer, lunched an official investigation. However, no criminal charges were ever filed. The bank was quickly dissolved. None of the funds were never recovered. Vague, poorly written banking and embezzlement laws were partly to blame. But more importantly friends and conspirators in the state legislature succeeding in delaying and blocking further legal action. 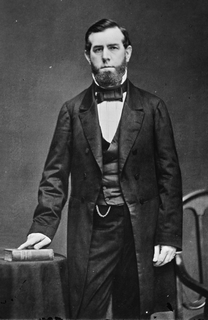 Henry Bates was impeached and removed from office. He quietly left office a disgraced but wealthy man. At the beginning of the Civil War, Fremont commanded the Department of the West. Palmer again linked up with Fremont and together they became wartime profiteers until Fremont was removed in disgrace. Fleeing to New Orleans, Palmer may have orchestrated a major insurance fraud involving the mysterious disappearance of his heavily insured cargo ship. 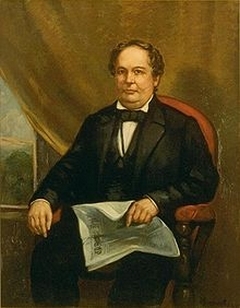 Edward Jones died in 1859. Charles Cook returned to the East Coast. George Wright went to Washington D.C. Once there he wrangled an expensive contract from the U.S. Navy for designing a new ship. The project failed, costing the Navy a great deal of money. In summary one might say that without just laws a good society is difficult to achieve. A California historian might also observe that, "It is good to have low friends in high places."